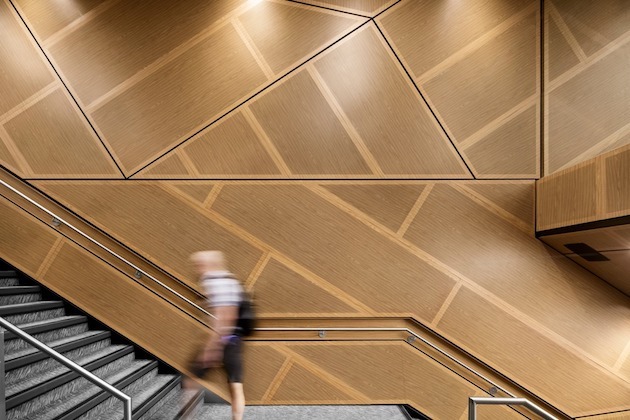 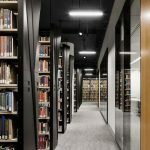 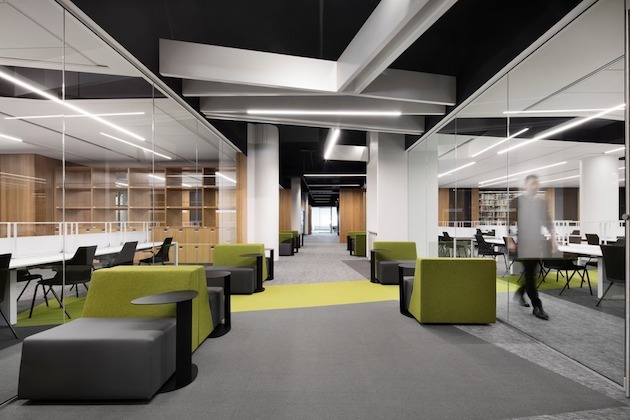 Following a multi-year construction process, the official opening of the new Webster Library at Concordia University took place in March 2018. 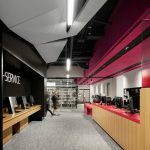 Designed and realized by Menkès Shooner Dagenais LeTourneux Architectes, this major expansion and renovation project aimed to create a landmark on campus, a central location to boldly integrate digital technologies and anticipate changes inherent to the next generations of libraries. 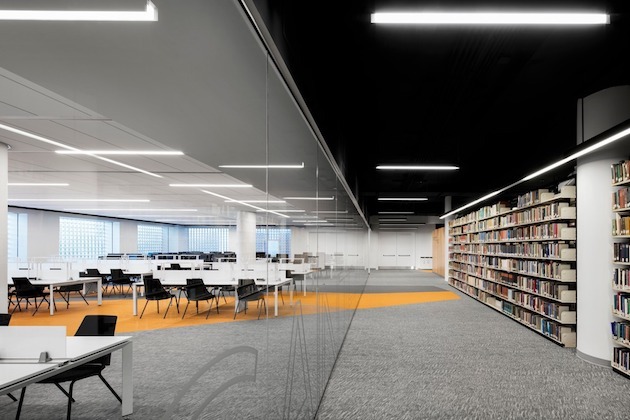 The main challenges were concerned with the redeployment and optimization of existing spaces to increase the seating capacity from 1,500 to 3,300 seats, the redefinition of service areas (counters, offices, consultation) and use (reading areas, collaborative work), the maximization of stack space for books and the enhancement of the digital collection. 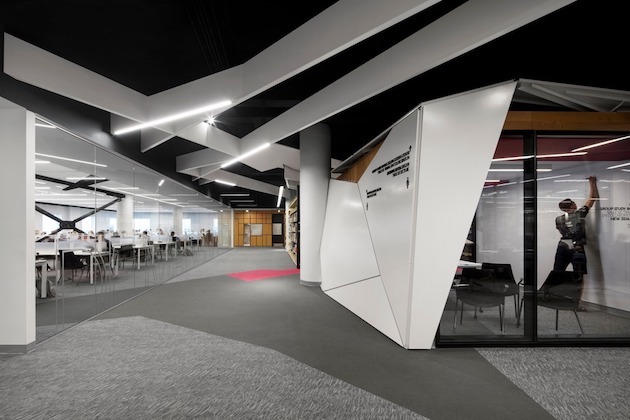 The conceptual approach developed by the architects produced a clear strategy regarding the organization of the collections and users’ circulation routes. 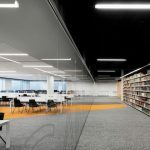 Playing on the theme of anamorphosis, the project proposes a complex network of lines and colour swatches which challenge the user’s perception and suggest that learning and knowledge are constructed from an individual point of view. 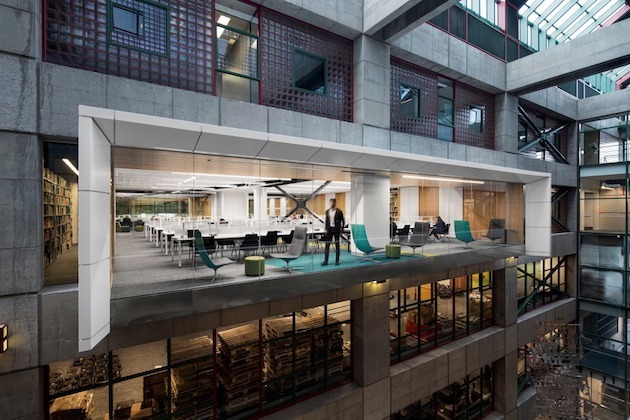 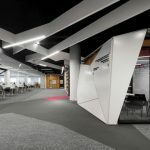 The new library is a reflection of evolving knowledge and active learning as a new way of sharing knowledge. 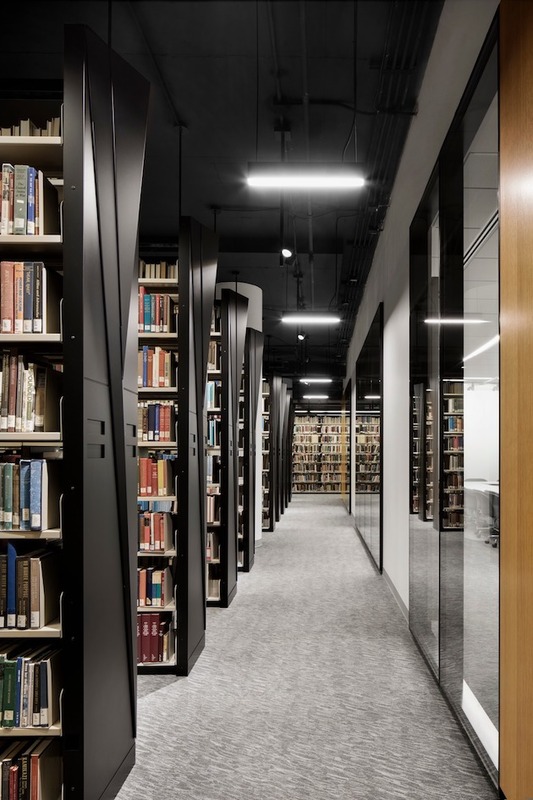 Thus, the pavilion housing the library is polychromatic and marked by the use of multiple grids of finishes. 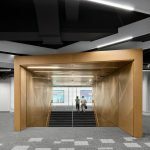 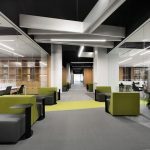 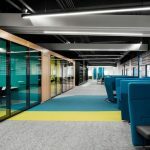 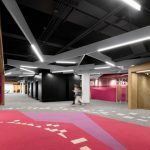 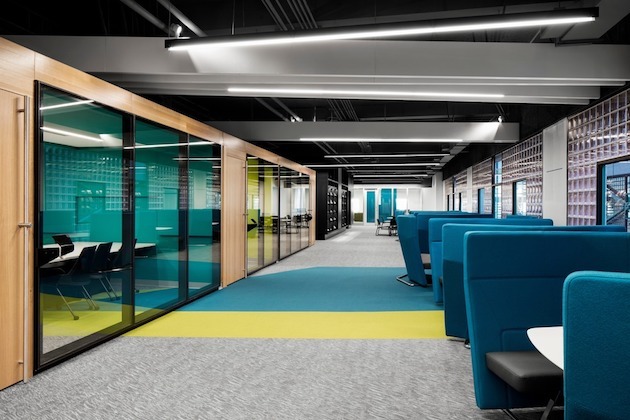 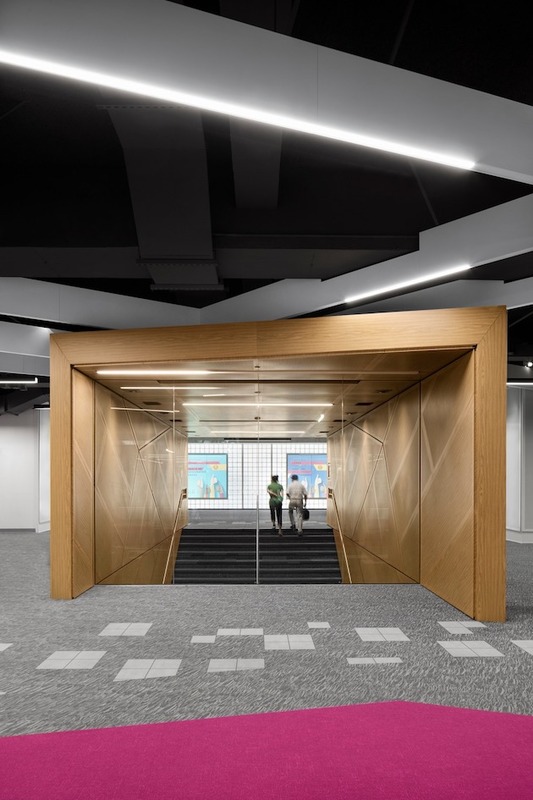 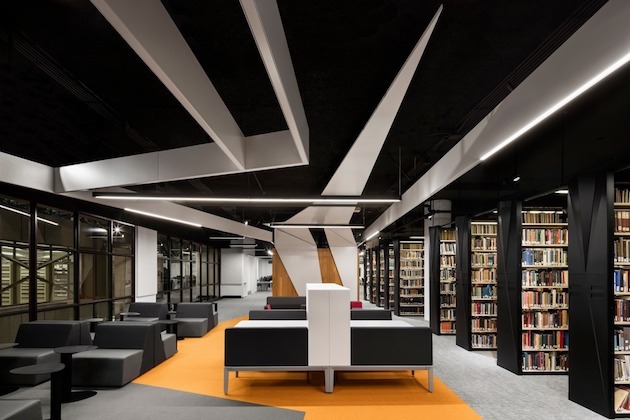 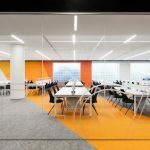 The main finishes consist of black (stack spaces) and white (individual workspaces) which clearly differentiate and distinguish the premises in the new library. 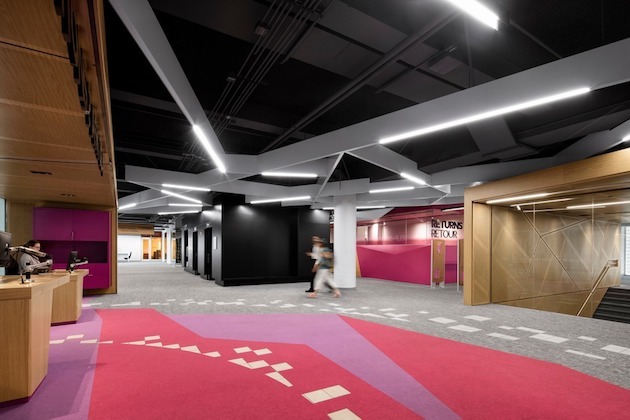 A skillful variation of secondary colours indicates the transition between the four floors of the project. 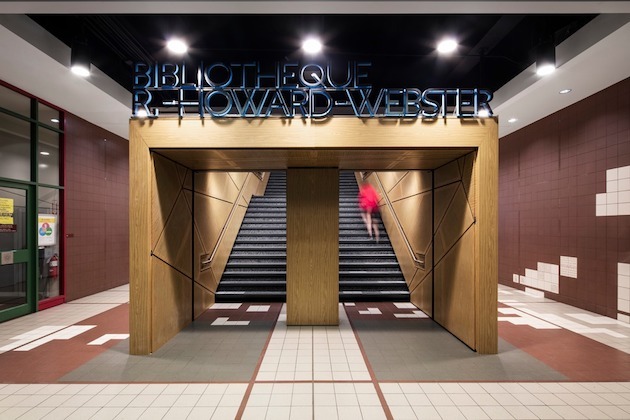 Designed to meet the needs of all users, each area of the Webster Library benefits from improved visibility while affirming its own identity.